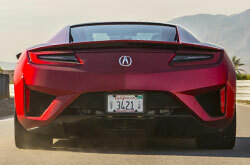 The Acura NSX is back after a 12-year break, once again giving drivers a truly modern sports car that boasts everything from a twin-turbo V6 and three electric motors to a double wishbone front suspension and an aerodynamic body frame. 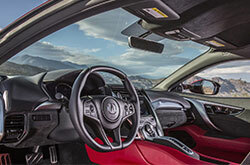 On top of that, the 2017 Acura NSX near Phoenix gets several high-tech interior features, as well as a plethora of safety amenities that make it an exciting choice for Valley sports car shoppers. The 2017 NSX is a two-door, two-seat coupe that fits nicely in the array of available supercar models available on the market today. 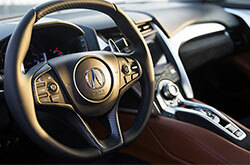 Shoppers looking for the 2017 Acura NSX in Peoria will find one main trim level on the sports car that comes with such standard features as LED headlights, adaptive suspension dampers, 19-inch front wheels, 20-inch rear wheels, leather upholstery, dual-zone automatic climate control and a 7-inch touchscreen, just to name a few. 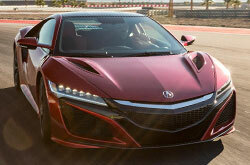 Drivers will also find a few optional packages on the NSX, including the Technology package that comes with everything from a navigation system to satellite radio. Other standalone features include summer performance tires, premium paint colors, carbon-ceramic brakes and more interior styling options. 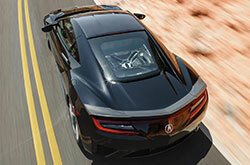 One of the biggest innovations on the supercar, according to several 2017 Acura NSX reviews, is its hybrid powertrain. This powertrain is made up of a turbocharged 3.5-liter V6 and three electric motors, all of which help propel the car to a fantastic 573 horsepower and 476 lb.-ft. of torque. A nine-speed automated manual transmission gives the supercar a very smooth ride, while also contributing to its impressive overall fuel numbers. As a leading new sports car on the market, the 2017 NSX also comes with a notable array of safety equipment, such as side-protecting airbags, front-and-rear parking sensors and a rearview camera. Many 2017 Acura NSX reviews have also noted that AcuraLink is standard on the NSX, adding such high-end systems as emergency assistance, stolen vehicle location and automatic collision notification. To find out even more about the 2017 Acura NSX, visit our Peoria Acura dealership today! Purchase prices do not include tax, title, license and $395.00 doc fee. 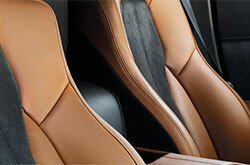 Prices include the listed incentives. Please verify all information. We are not responsible for typographical, technical, or misprint errors. Inventory is subject to prior sale. Contact us via phone or email for more details. 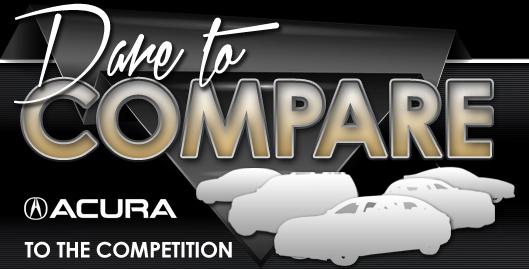 *MPG Based on 2018 EPA mileage ratings. Use for comparison purposes only. Your mileage will vary depending on driving conditions, how you drive and maintain your vehicle, battery-pack age/condition, and other factors.